Nine hundred ducks from Indiana are expected to be delivered by the end of the week to DaDong, a new Chinese restaurant in Midtown Manhattan. That’s about two weeks’ worth for the restaurant, which specializes in Peking duck. There’s nothing unassuming about this restaurant, scheduled to open Dec. 11 in an office tower across from Bryant Park. It is the first branch outside China for a Beijing-based company that has 24 outlets, with two more opening in China this year. The Manhattan branch has 440 seats, including about 200 on outdoor terraces, sprawled over 17,500 square feet on the building’s second and third floors. The menu lists 80 dishes, each photographed for separate pages of the coffee-table book that amounts to a menu, and more than 300 wines. Five immense, specially built vertical ovens will crisp and burnish the ducks. A few weeks ago, within the first two hours of becoming available, 2,500 reservations were booked through February, overloading the phone lines. 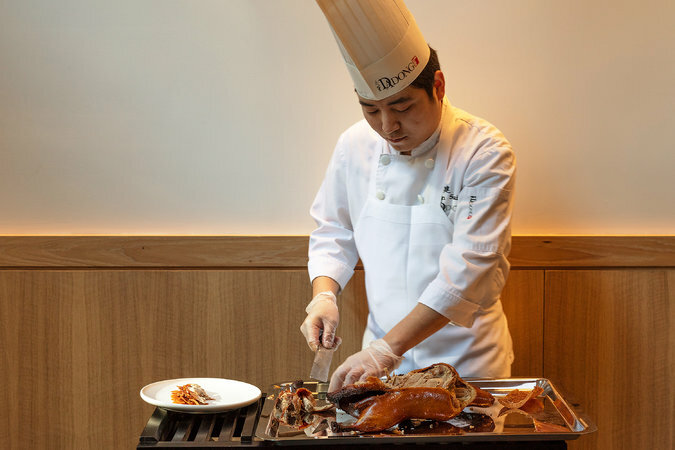 As big as all this might sound, it’s actually modest in comparison with the restaurants that the chef Dong Zhenxiang, the chain’s owner and founder, has opened in China in the last 22 years. They range from 30,000 to 60,000 square feet, with a 238-page menu listing 240 dishes. Mr. Zhenxiang, 56, also has a chain that serves duck burgers. 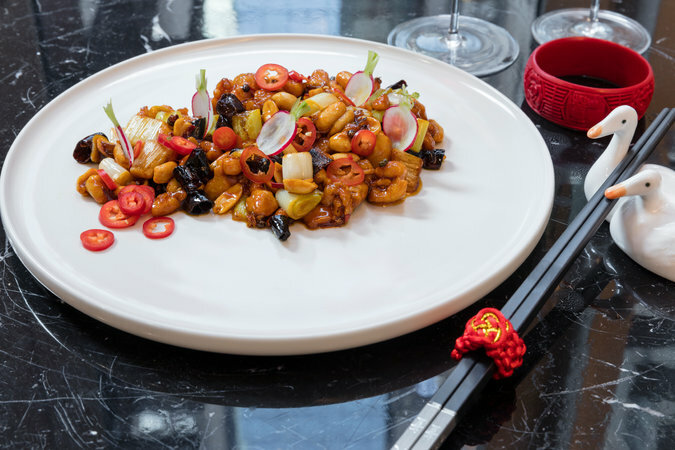 In New York, it joins Chinese restaurants, like Tang Hotpot and Chinese Tuxedo, that have been departing from the norm with less traditional menus and décor; DaDong stands out for its size and approach. It was designed by the architect George Wong, who specializes in hotels. The entrance is an impressive wooden door in a promenade that runs between 41st and 42nd Streets, just west of Avenue of the Americas. The second-floor dining room combines a square central bar with a lighted surface and 32 seats, dining tables and a lounge area. Clusters of sculptural, gilded scrolls hang over the bar and lounge. The third floor, done in white with geometric screens, is for tasting menus and private dining. There is outdoor terrace seating on both floors. 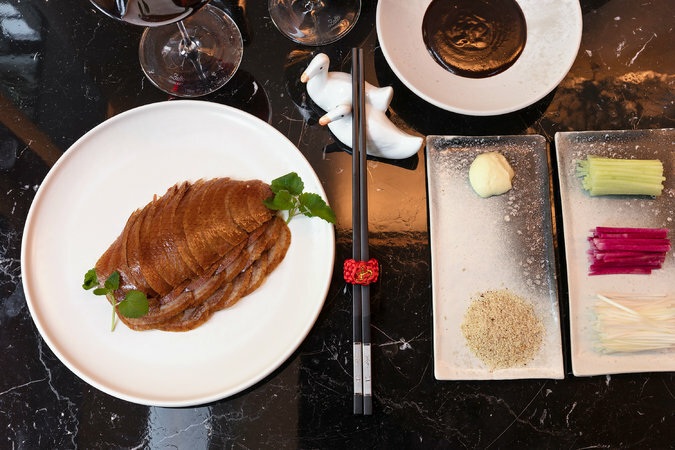 The signature roast duck ($98 whole, $58 half), from a breed that Mr. Zhenxiang developed over two years with Maple Leaf Farms in Indiana, is served with pancakes, buns, sauces, julienne vegetables, sugar and garlic. It is meant to be eaten four ways, with different ingredient combinations. The meat is sliced paper-thin. (The restaurant gets an estimated 96 slices from a single duck.) But unlike at the Chinese locations, the dish does not come with a plate of duck innards and feet, nor is it possible to order duck webs with mustard sauce. 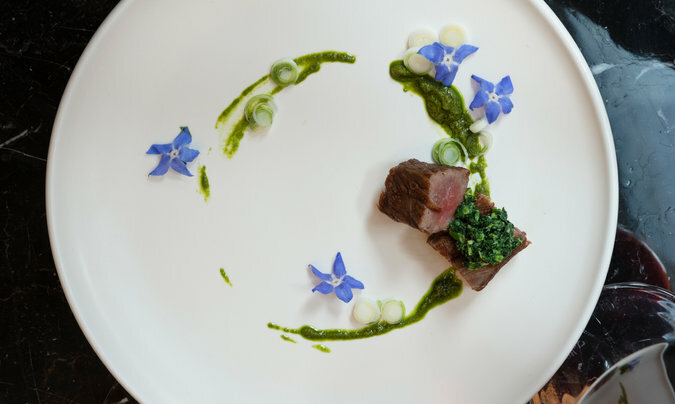 For the New York branch, the executive chef, Andy Xu, will be preparing exclusives like a lobster soup, kung pao chicken, black pepper Wagyu beef and five-flavor cheese mousse. Forget about river crab dishes, jellyfish or fish maw, though sea cucumbers, smoked salmon with avocado, braised beef cubes in chile oil, and king crab golden hotpot are served in New York. Michael Scaffidi, the wine director, has divided the mostly French list by vintage years, according to the Chinese signs of the zodiac. (The 2017 Beaujolais nouveau, for example, will be under the rooster heading.) He also believes that Champagne and white Burgundy are best with the food, so there are some Champagnes for less than $70 a bottle, to encourage diners to see things his way. There is also a selection of dramatic cocktails, including the Fire Rooster, made with pepper vodka and Campari. But if you want to drink Chinese style, here, as in China, you can get to know baijiu, one of the world’s most widely consumed spirits. DaDong, 3 Bryant Park (between 41st and 42nd Streets, near Avenue of the Americas), 212-355-9600, dadongny.com. An earlier version of this article incorrectly identified a cocktail that will be served at DaDong. It is the Fire Rooster, not the Fiery Rooster.